Bethel Music Featured Music Songs Wow! I’ve been hooked on a new song from Bethel Music called “Goodness of God“. 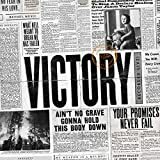 This is the third song from Bethel I’ve recently become hooked on, and I just realized they’re all from the same album, called Victory. I just realized another reason why this album is incredible…..it’s produced by Ed Cash! Ed Cash is a legend, and when Chris Tomlin partnered up with Ed Cash for their first album, they began producing one incredible worship album after another. Great work to the team and band, especially lead singer Jenn Johnson! mashsb_og_description: It's on repeat on my player!